Pioneers in the industry, we offer designer fashion suit, kurti with skirt, mirror work kurtis, full length printed kurtis, modern flower print kurti and georgette ladies suit from India. In order to comprehend and meet the diverse demands of clients, we are able to offer an extensive array of Designer Fashion Suit. We are one of the leading manufacturer and supplier of Mirror Work Kurtis.We obligated to meet the quality standards, as per the customer demand. In order to comprehend and meet the diverse demands of clients, we are able to offer an extensive array of Georgette Ladies Suit. 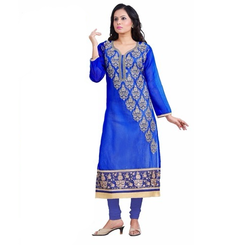 We are the leading supplier and the manufacturer of the Chanderi Ladies Suit and Designer Suit. In order to comprehend and meet the diverse demands of clients, we are able to offer an extensive array of Ladies Designer Salwar Kameez. Keeping track of latest market development we are actively engaged in offering an exclusive range of Unstitched Ladies Suit. The offered range is designed with the help of premium quality fabric and contemporary machines in compliance to set industrial standards. This suit is worn by ladies on various occasions like kitty parties, functions, celebrations etc. Clients can avail this range from us in various colors, designs and patterns. In order to comprehend and meet the diverse demands of clients, we are able to offer an extensive array of Designer Long Kurti.